December 2016 – OpenTech Alliance, Inc.
CEO Robert Chiti (left), and Joe Arnone, Vice President of Product Management cut the ribbon on the new OpenTech Labs. 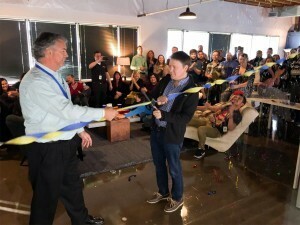 OpenTech Alliance cut the ribbon on it’s new software development center dubbed “OpenTech Labs” today. Presiding over the festivities is OpenTech Alliance President and CEO Robert Chiti, and Joe Arnone, Vice President of Product Management, who provided the impetus to make this a reality. The new OpenTech Labs is a part of OpenTech’s push into new products and services geared towards adding value to it’s core technologies in the self storage rentals market. OpenTech Alliance provides a line of integrated hardware, software and solutions that improve customer service, efficiency, and profitability for self storage facilities nationwide. OpenTech Labs designed the new space in a bid to attract up and coming developers to it’s growing operation. “With the market for tightening, we need to compete more aggressively to find and keep high quality talent” according to Chiti. “what has worked in the past has to make way for new realities”. With growth coming in a range of SaaS (software as a service) products, along with OpenTech’s “StorageTreasures.com” online auctions website, the need for high quality programmers and product developers is continuing to increase. By providing a fresh and open workspace, OpenTech Labs aims to improve internal collaboration while better offering a more inviting work environment for it’s development teams.